Sarah Harris, the lucky winner of our Twitter and Facebook competition enjoyed a three-night stay at ‘High Tides’ with her family. Sarah headed down to North Norfolk for a weekend break with her husband and two teenage children from their home in Cambridge. “I’ve always wanted to stay in Blakeney, so I entered the competition without hesitation. It was very exciting when I won – I was on the phone to my best friend and received a tweet saying ‘You’ve won a holiday’,” she says. The Harris family were blown away by the incredible sea views at High Tides. “The view was amazing. You walk into the living room and there’s this huge window which looks out on to the quay. There’s also another window to the side of it, so it’s like this picturesque panorama. “It’s absolutely stunning, certainly the nicest view we’ve had compared to anywhere else we’ve been. I would just sit on the comfy window seat admiring the view for ages. The balcony really added the wow factor too.” says Sarah. 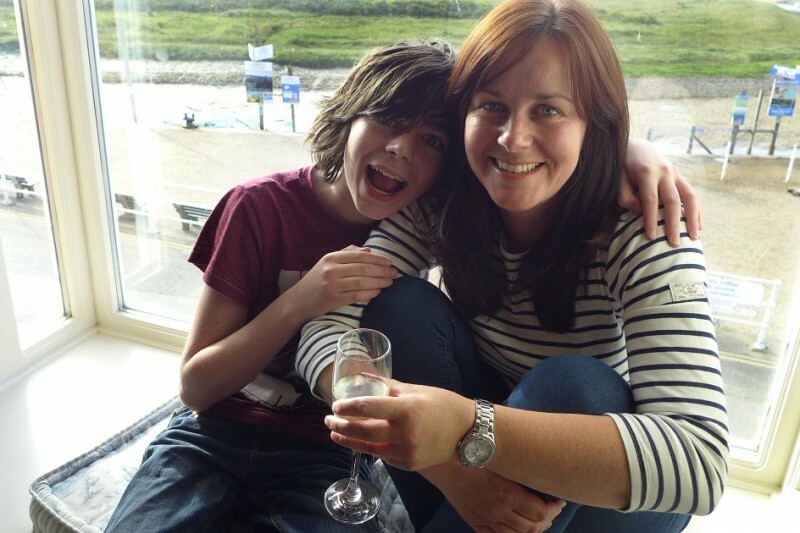 Pictured above: Sarah and son Sam enjoying the window seat where you can enjoy breathtaking views at High Tides. With everything on their doorstep, the family found High Tides an ideal coastal retreat. 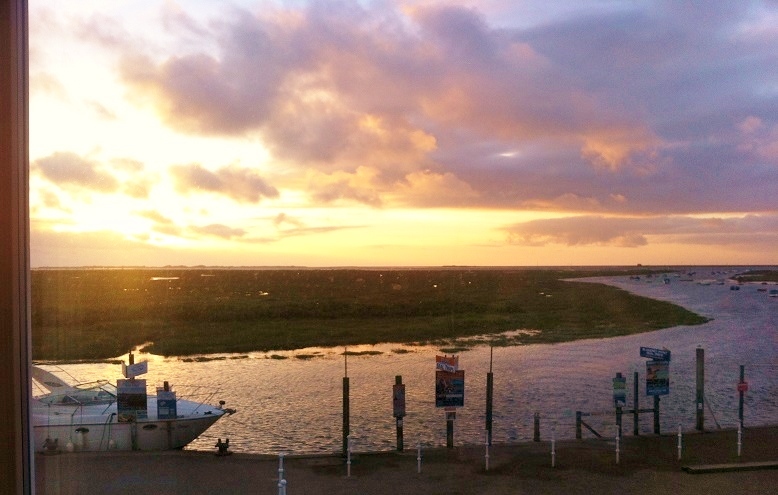 “If you want to stay in Blakeney, you can’t get a better location than High Tides. You’ve got the sea right on your doorstep and the views are just so pretty. Sarah has stayed in Cromer in North Norfolk before and loves the peaceful atmosphere it offers. “The North Norfolk coast is so relaxing and idyllic, I prefer it to the south coast. The north is just so unspoilt and beautiful, I’m surprised it’s not more built-up and populated, but that’s one of the great things about it. Pictured above: The view from High Tides cottage at sunset. As a published novelist, the unique towns and villages around Norfolk have inspired Sarah to write her latest fictional story ‘The Boy in the Wide Sky’. The family’s mini-break allowed them to really relax, so trips weren’t on their agenda. But they did enjoy coastal walks, leisurely lunches and a spot of shopping in Holt. “It was nice to go on quiet strolls along the beach. We were quite happy exploring Blakeney beach, it’s so beautiful and right outside the cottage so we didn’t need to go any further afield. North Norfolk is the perfect place for food fanatics, so there was no need to think about cooking during their stay. “On our first night we ate out at the Kings Arms and as Sunday was Father’s Day, we had lunch at The Salthouse Dun Cow. Both places were brilliant with gorgeous food. “We also had fish and chips in Holt from a place that was recommended in the welcome book – that was really tasty. “There are lots of lovely delis and cafes, so you’re really spoilt for choice,” says Sarah. Sarah describes Blakeney as a special place to be, unique compared to other British seaside destinations. The Harris family loved their stay so much, they can’t wait to go back and visit beautiful Blakeney again. “I’d love to go back and spend more time in Blakeney and the surrounding areas. We could have easily filled a week with all the nice areas you can explore. Book your stay at ‘High Tides’ today. This luxury property sleeps six and offers some of the best coastal views in Blakeney.